Jesse McCartney’s First Grammy Awards! Jesse McCartney's hitting the Grammys for the first time ever this weekend… and he'll be rooting for Leona Lewis! Why? Although Jesse's hits "Leavin'" and "How Do You Sleep?" are rockin' the charts, it's his songwriting skills that landed him at the big-time award show. Yup, he co-wrote "Bleeding Love" with One Republic's Ryan Tedder… which is nominated for the biggest award of the night, Record of the Year! J-14 chatted exclusively with Jesse this week to get the scoop about his Grammy adventures! J-14: How does it feel to be nominated for a Grammy? Jesse: I'm just so thrilled. It's amazing for us and for Leona. It's the Grammy awards. It's one of the biggest and more prestigious nights for the music industry and everyone and their mother will be there, so it's going to be cool. 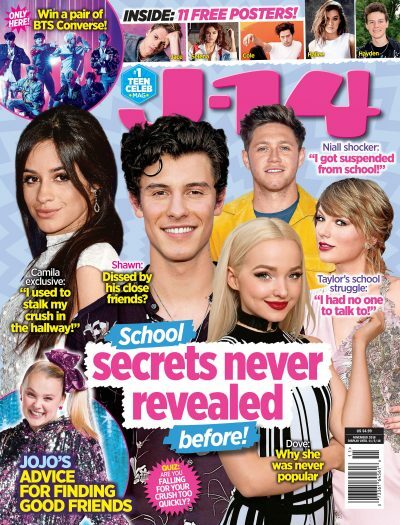 J-14: How did you find out about the nomination? Jesse: It's funny — I was on tour and traveling a lot with Katy Perry because she was on the same route. We found out simultaneously that she got nominated and that "Bleeding Love" got nominated. It was a big night! J-14: What does a Grammys mean to you? Jesse: This is going to be my first time attending the Grammys. I love the Grammy Foundation — I'm getting more active with them and really trying to give back to the kids out there. I just did Career Day with the Grammy Foundation a couple of days ago. They bussed these kids in from inner-city schools to teach them about music and get them involved in the whole music industry. Everyone over there at the Grammy Foundation is really fun to be around so it's going to be a good weekend. J-14: What will be going through your head when they're about to announce the winner in your category? Jesse: I'm sure that I'll be sitting on the edge of my seat a little bit! J-14: Do you ever wish you sang "Bleeding Love" on your album? Jesse: No, I don't. I did sing it when I recorded the demo of it, but I don't regret it at all. Leona really owned the song and made it what it is today. Who knows if it ever would have blown up if it was recorded by me or any other artist. It may have had to be for Leona — and Leona only. I really have no regrets about and I can't complain. She got me a number one hit!